JE C these boards look to me to be very old. I have the same in my house as they were laid 70 years ago, green and then carpeted as was the fashion. Only the the poorer showed they had floor boards. As the timber dried it created the gap between the boards. Therefore it maybe hard to replicate but I would be interested if someone has a different view. Contemporary Flos pendant lights from Euroluce bring focus to the central island and contrast with the period features, such as the cornicing and ceiling battens. Erik Buch stools from Great Dane Furniture bring a retro twist and capture the essence of the eclectic space. 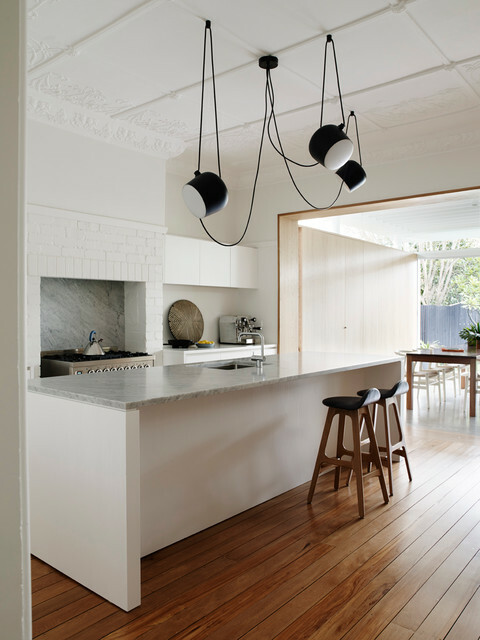 Like the colour scheme and the seating/benchtop arrangement.